THIS WEEK’S OTHER FEATURED BOOKS, “BEAUTIFUL APE GIRL BABY,” BY HEATHER FOWLER AND “MAN BITES CLOUD,” BY BOB SCHOFIELD, CAN BE FOUND BY SCROLLING DOWN BELOW THIS POST. SUMMARY: It is December of 1649 as England’s uncrowned king, Oliver Cromwell, leads his brutal army across Ireland to crush a violent rebellion. Elvy Burke, daughter of a great warrior, wants one thing—to live her destiny as a leader and defender of her country. As the cavalry approaches, Elvy knows she will not give up easily. When Cromwell cruelly beheads a village boy, Elvy vows to destroy him. After fleeing from his soldiers, she aligns with a Scottish outlaw whose schemes send them headlong into a tumultuous journey across the sea to the West Indies, where she is indentured on a sugar plantation. Here she must learn to survive, to discover the depth of her own strengths and emotions, and find a way back to Ireland to confront her sworn enemy. 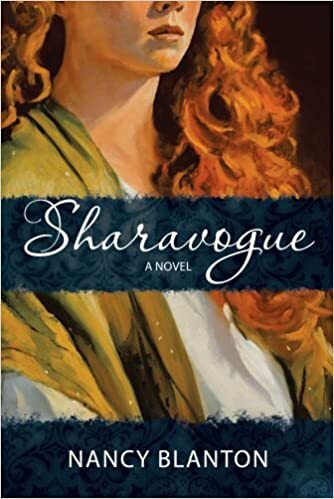 Sharavogue is the compelling story of one girl’s journey through the lawless lands of Ireland and the West Indies as she struggles claim her destiny. THE BACK STORY: Before my Irish father passed away, he asked me when I would start writing. This surprised me. I didn’t know he cared about that. Writing was my dream, and he’d urged me toward something more practical. I’d been writing bureaucratic corporate stuff so long I was not sure I could write creatively anymore. He simply said, you’ll write when you’re ready. Almost a year to the day later, I heard the phrase “snow path to dingle” in my sleep. It woke me up and wouldn’t leave me alone. I began to research what that phrase meant. The research led me first to Ireland’s Dingle peninsula and the siege of Smerwick, 1580. Here, the great Earl Grey led a siege against 600 Spanish and Italian soldiers who had come to support Irish rebellion against the Protestant English. Grey starved them out and massacred the soldiers most brutally. Then, I found a book of interviews with Irish people who witnessed Oliver Cromwell’s atrocities in Ireland from 1649 – 1652. One man said Cromwell’s march had followed a horrible omen, a full yellow moon encircled by blood red and cleaved in two. I was fascinated, I was hooked, and Sharavogue is the result. WHY THIS TITLE? : The story in Ireland during Cromwell’s march naturally led to the West Indies where many Irish were shipped to work as slaves, and some relocated voluntarily to find work or property. A colony of Irish planters developed on the island of Montserrat, and they too owned slaves. The protagonist is swept away to the island and indentured for seven years on a sugar plantation named “Sharavogue,” which in Irish means “bitter place.” I liked the sound, the mystery and the irony of this word. WHY SOMEONE WOULD WANT TO READ IT: Winner of Florida’s Royal Palm Literary Award for historical fiction, this book captivates readers because it is fast-paced, exciting, covers a fascinating period in history that is not often covered in fiction, and is interwoven with actual historical events. It is a great opportunity for readers who love to learn as they read an entertaining book. The story also is relevant because it focuses on issues we still struggle with today, such as oppression of ethnic groups, mistreatment of women, the struggle for survival and the struggle to achieve one’s dream. The reign of Oliver Cromwell remains controversial to this day, because he tried to eliminate England’s monarchy and create a commonwealth, an idea that continues to circulate. Sharavogue is a story of revenge and self-actualization. It is about the obstacles that can confront you on your way to your goals. Ultimately, it is about the vast range of human emotion, from violence and hatred to love and mercy. AUTHOR PROFILE: Nancy Blanton has worked as a journalist, magazine editor, corporate communications leader and brand manager. Her first historical novel, Sharavogue, won first place in Florida’s Royal Palm Literary Awards. Her second novel, The Prince of Glencurragh, publishes in August 2016. She wrote and illustrated a children’s book, The Curious Adventure of Roodle Jones; co-authored the award-winning book Heaven on the Half Shell: the Story of the Pacific Northwest’s Love Affair with the Oyster; and spearheaded production of Rising Tides and Tailwinds, a corporate history book for the Port of Seattle centennial. bachelor’s degree in journalism, a master’s degree in mass communications, and has won numerous awards for professional leadership, writing, advertising and public relations products. She lives in Florida. I loved “Heaven on the Halfshell”–who knew the history of the oyster fishery could be so fascinating? Looking forward to reading this. Sharavogue is completely different, but sounds equally fascinating.